This frame serves to analyze a group of piles using the spring method. The analysis is run by pressing the "Analysis" button. Upon performing the analysis, the results appear in the right part of the frame ("Results") providing information about the maximum internal forces, displacements and rotations of a structure. Displacements of the structure shown in the window are determined for service loads. The "In detail" button opens the dialog window that contains a detailed description of the results of the verification analysis. Structure - allows for plotting a deformed structure (only undeformed structure can be displayed for envelopes of load cases), next it is possible to show the magnitudes of pile cap deflections, reactions and magnitudes of springs at the pile base. The displayed results can be added to the "List of pictures" at any time and used in the analysis protocol. 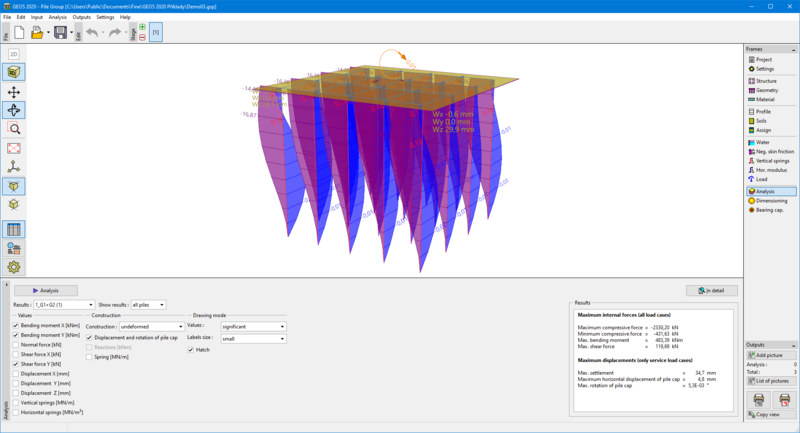 Rotation, zooming and illumination of a structure can be adjusted with the help of "Visualization" tool bar. Visualization of results can be adjusted in the frame "Drawing Settings".